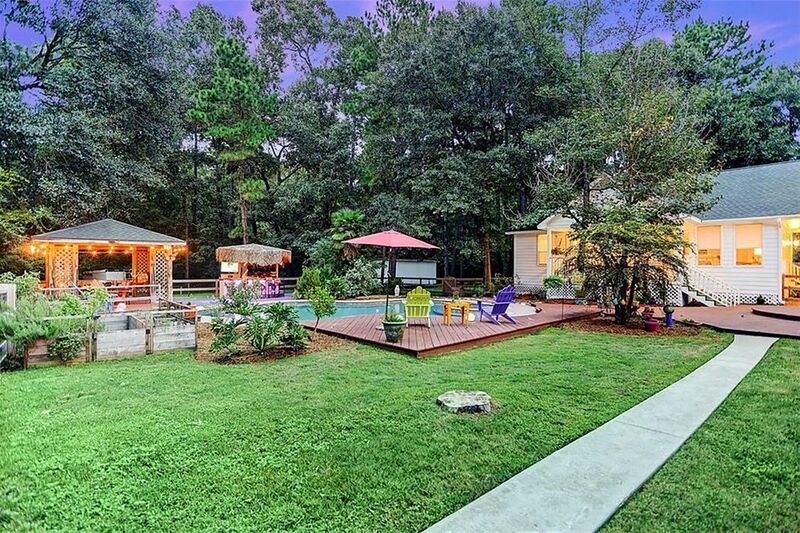 11777 Creek View Lane, Conroe, TX 77385 | Martha Turner Sotheby's International Realty, Inc.
A sneak peak into this back yard oasis offering a large in ground pool/spa, recently installed outdoor covered kitchen/bar, beautiful pergola for dining, and plenty of lounging space by the poolside. 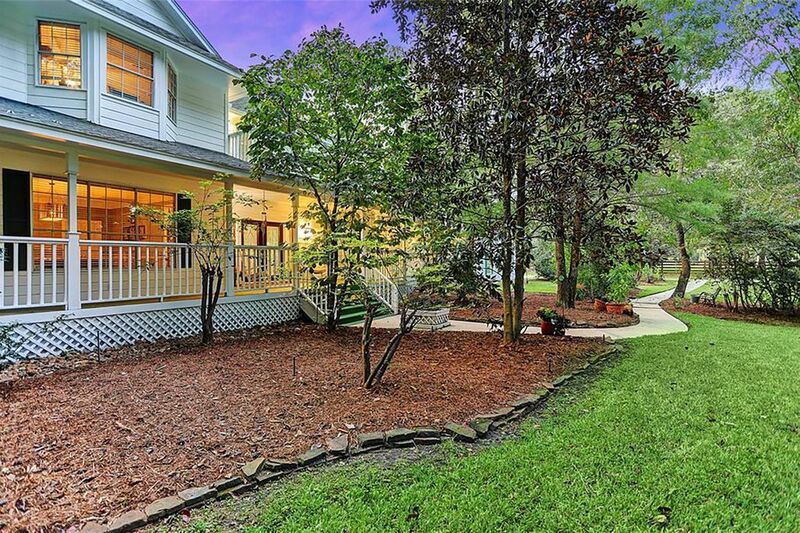 Tucked away tranquility of home with convenience to the amenities of The Woodlands nearby. 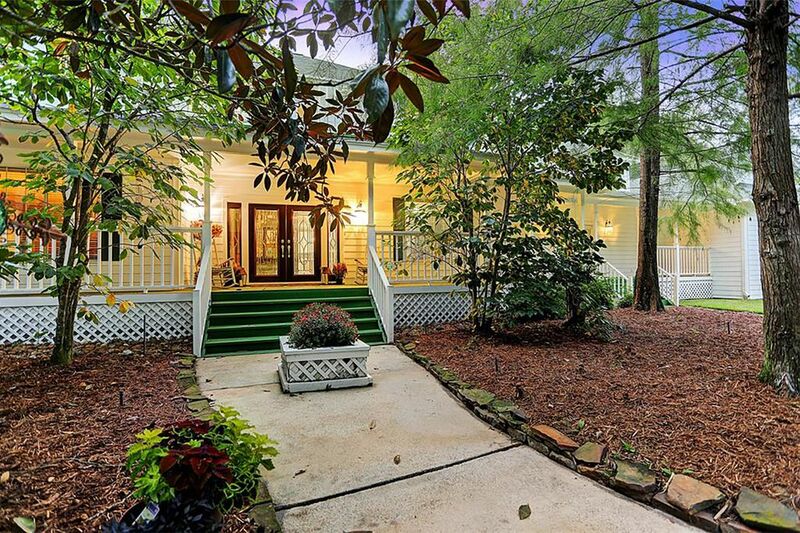 Beautiful and convenient 1.8 wooded acreage INCLUDED in purchase of this home. Can be sold seperately or you may build on to your liking. 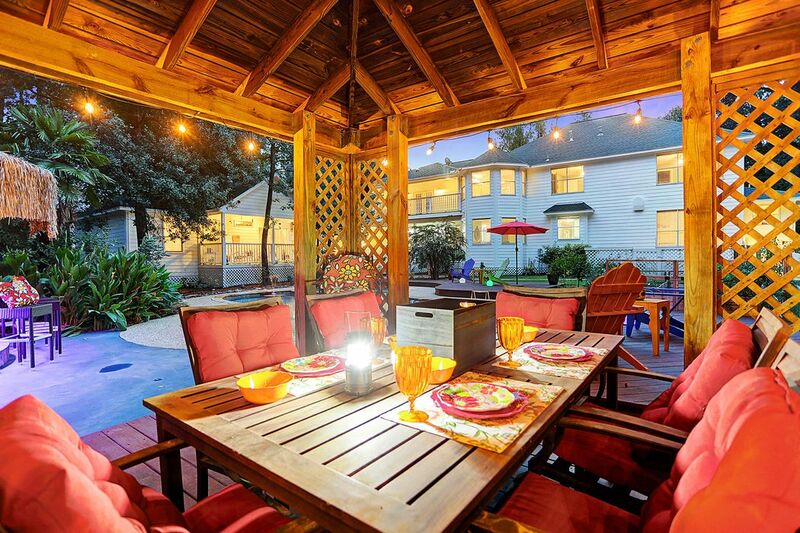 Venture outside to the resort pool and patio, dining space in the pergola, or relax and enjoy the summer kitchen area. 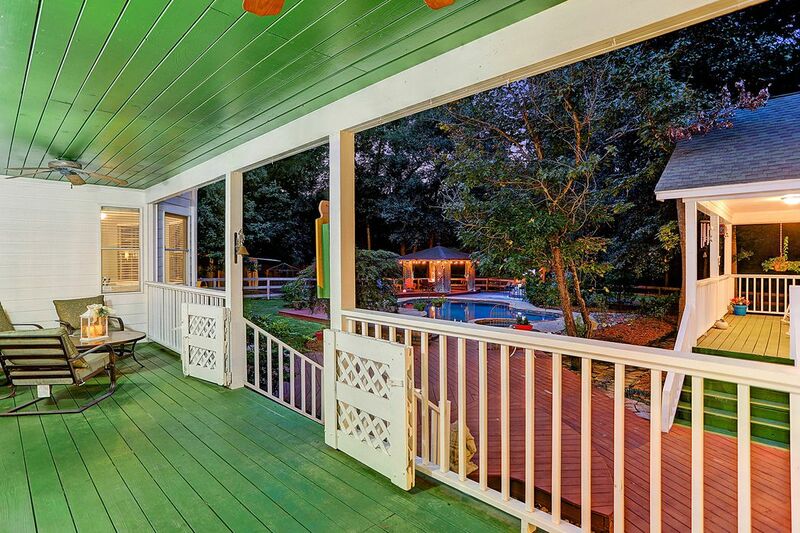 Gracious residence with over 1,800 sq ft of porches to enjoy. 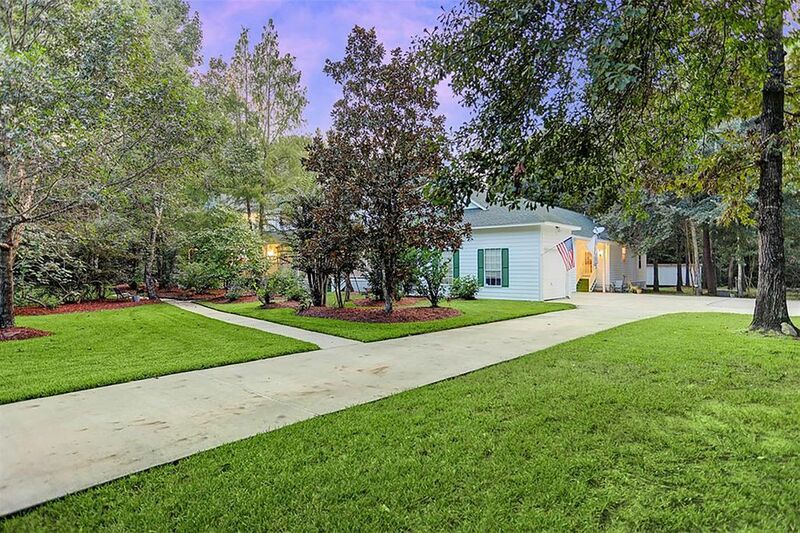 Wide driveway space with additional parking on both sides. In addition, covered parking space situates between the Guest House and Main House. 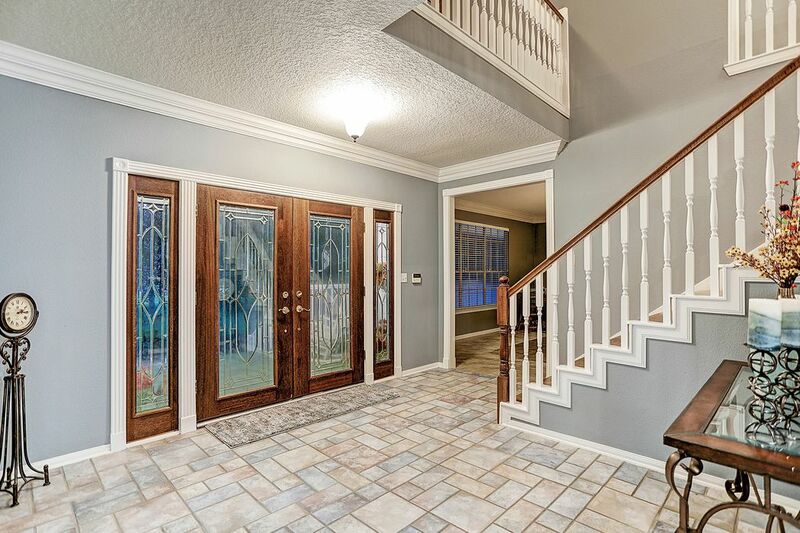 Double door entryway into this spacious and welcoming floorplan. One inside, you instantly feel at home. Extraordinary space is available for the head chef of the house! 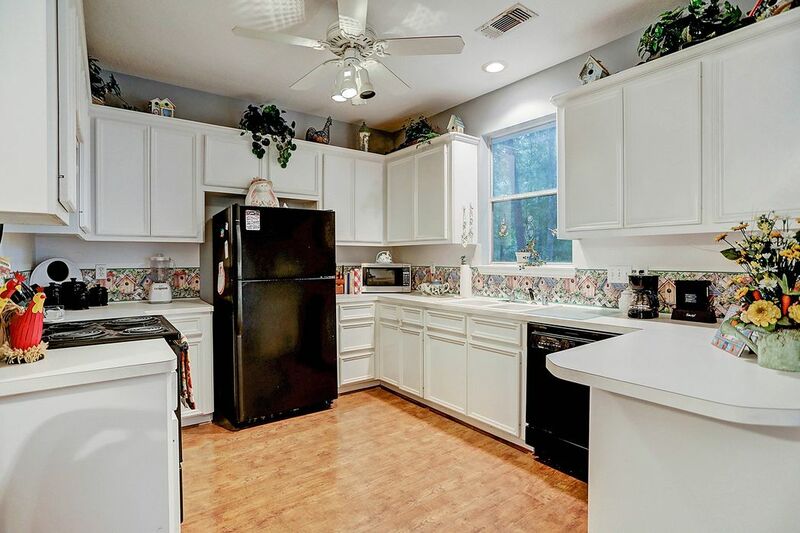 This kitchen offers recently upgraded Jenn-Air stainless steel stove and oven and recently replaced rich granite countertops. Welcome home! 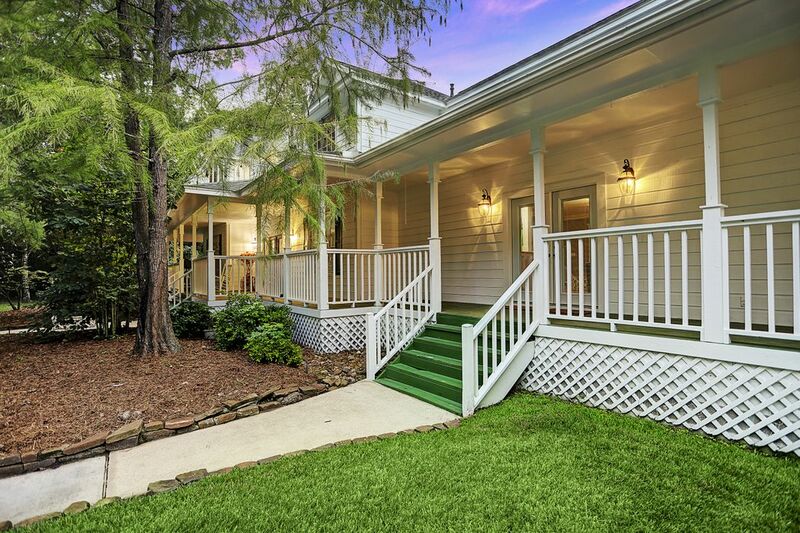 Step into this cozy country resort- like home and escape from the city noise. 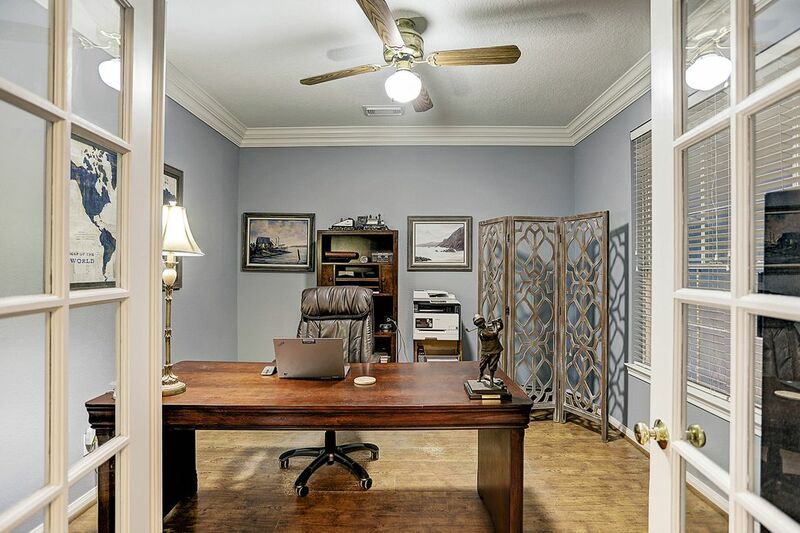 Located downstairs, sneak away into the secluded study. 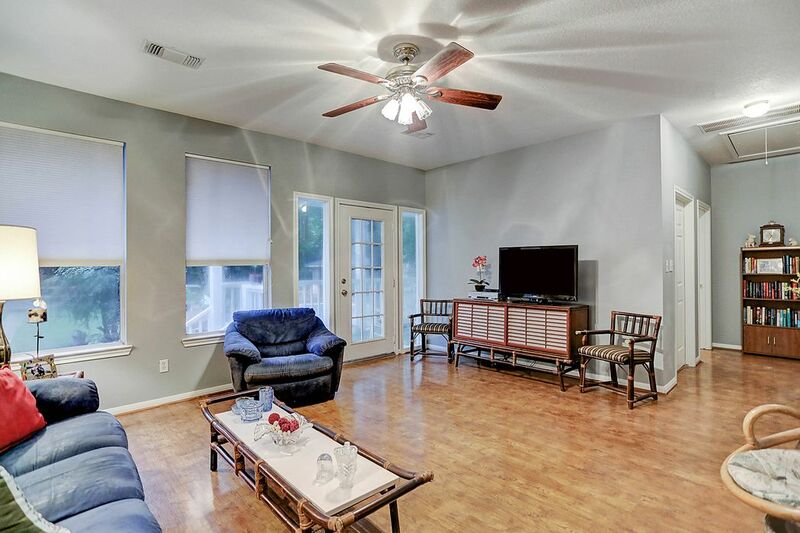 Natural light flows in seamlessly from the front property. 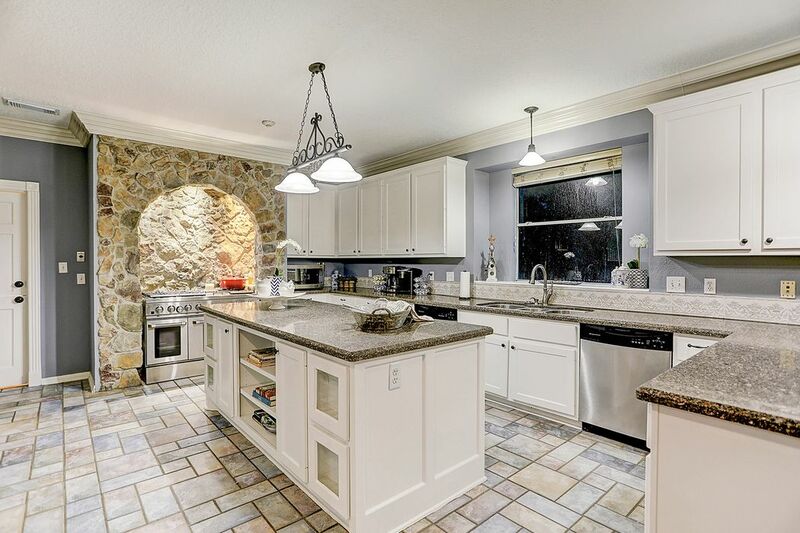 Beautiful stone accent wall giving this kitchen an extra wow factor. 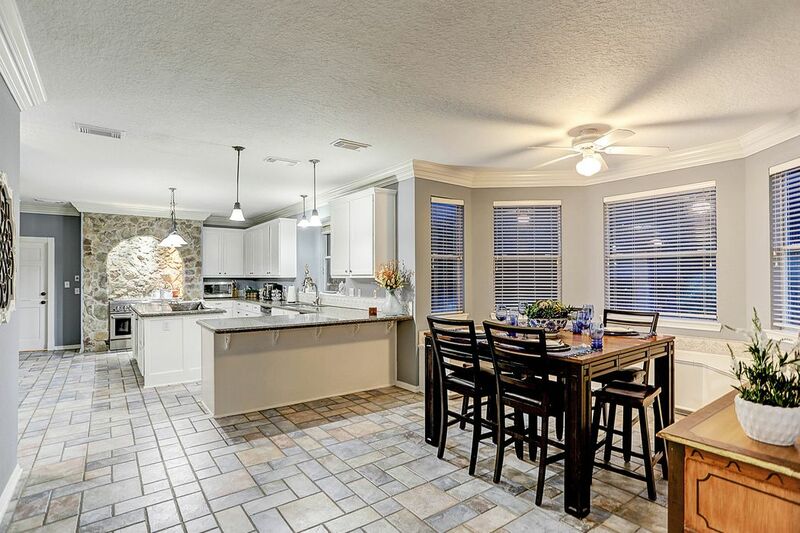 Double oven, 6 range gas stove top, and spacious granite countertops with polished cabinets for all your kitchen necessities. 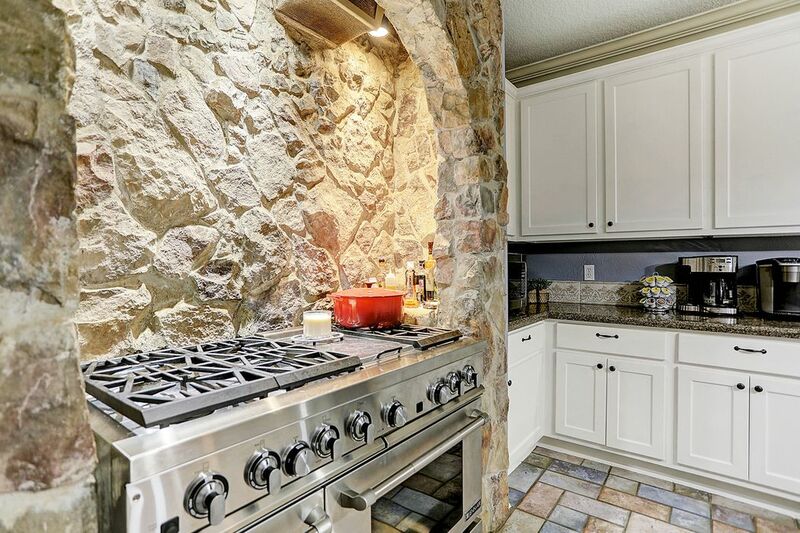 All appliances in this kitchen are top of the line stainless steel- Recently upgraded Jenn-Air 6 top stove and oven. 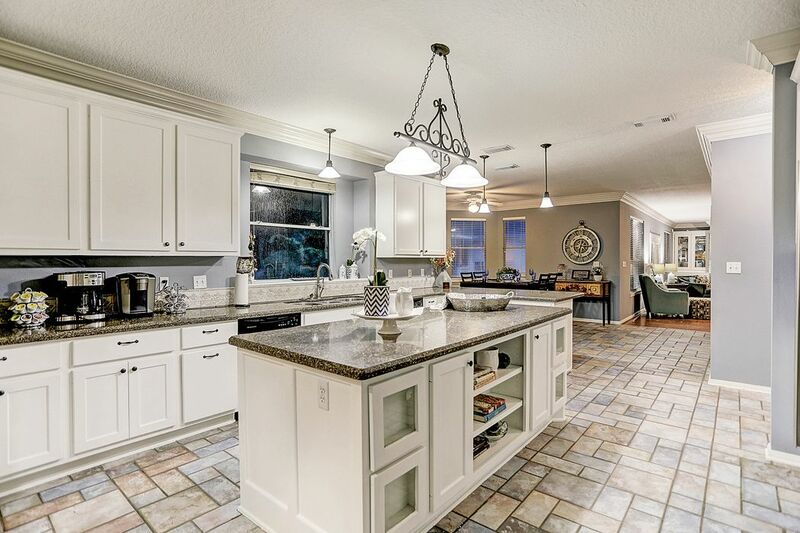 Expansive countertop space with oversized island for all your kitchen essentials. 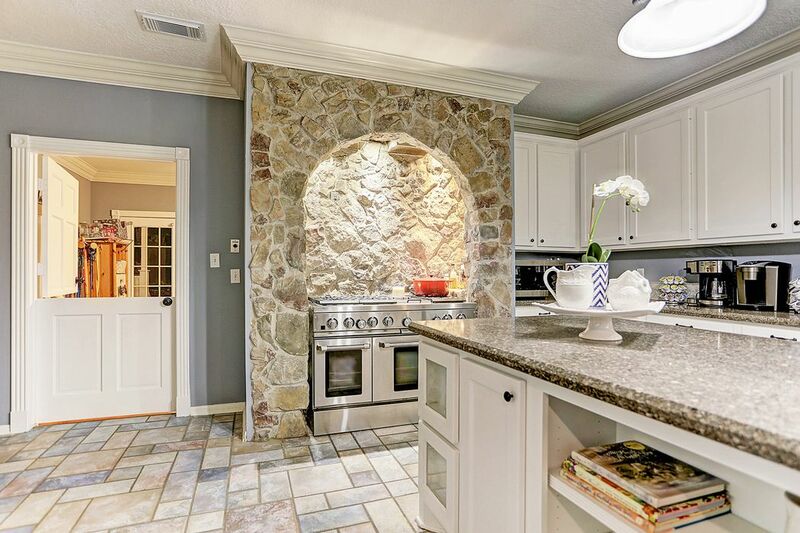 Just past the massive kitchen, enter your Breakfast room with full views of the back yard oasis. 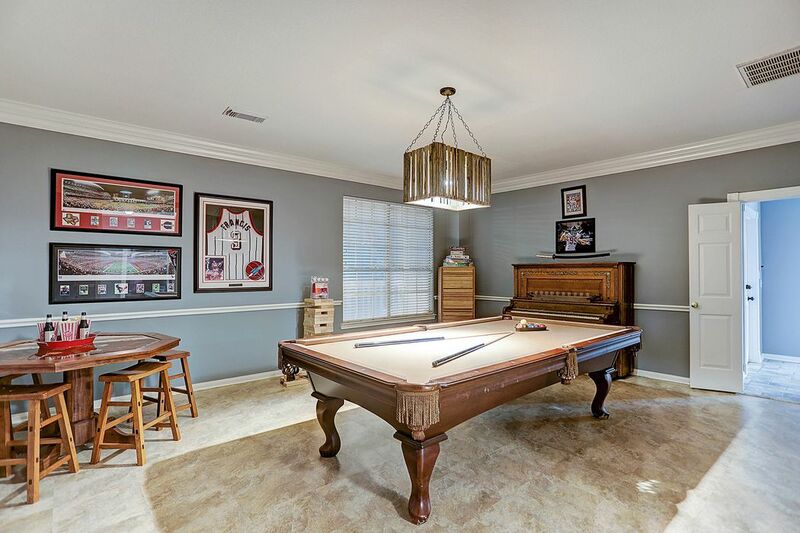 This downstairs Game room could also be used as a Dining Room offering double doors to the Kitchen and ample space for your greatest collections. 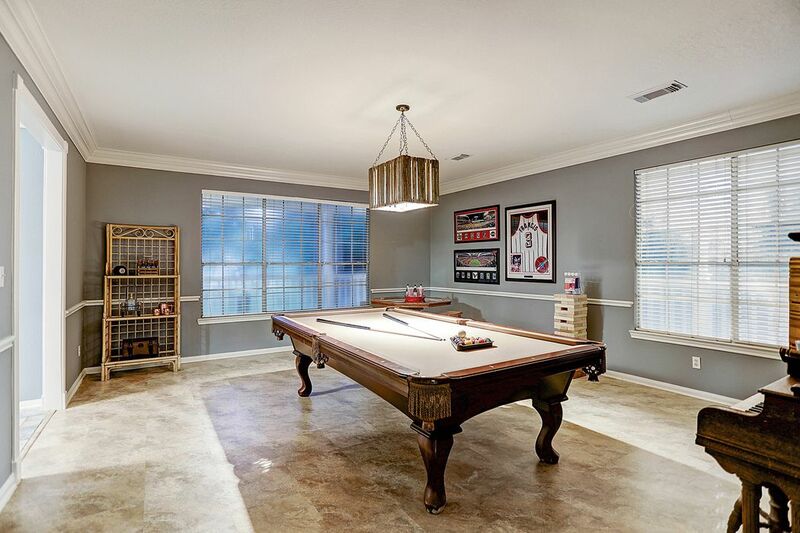 Enjoy your favorite game nights in this large entertainment space! 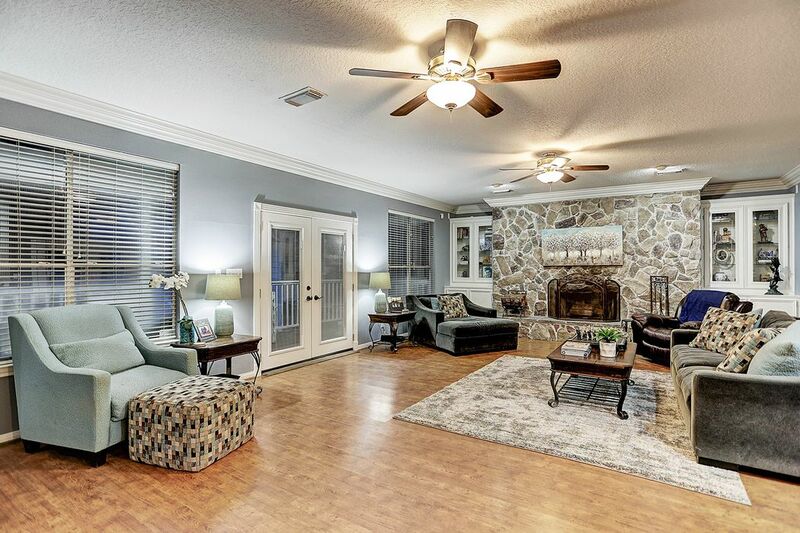 Walk out of these double doors into the covered back patio, poolside, and just feet away from the wonderful guest house. 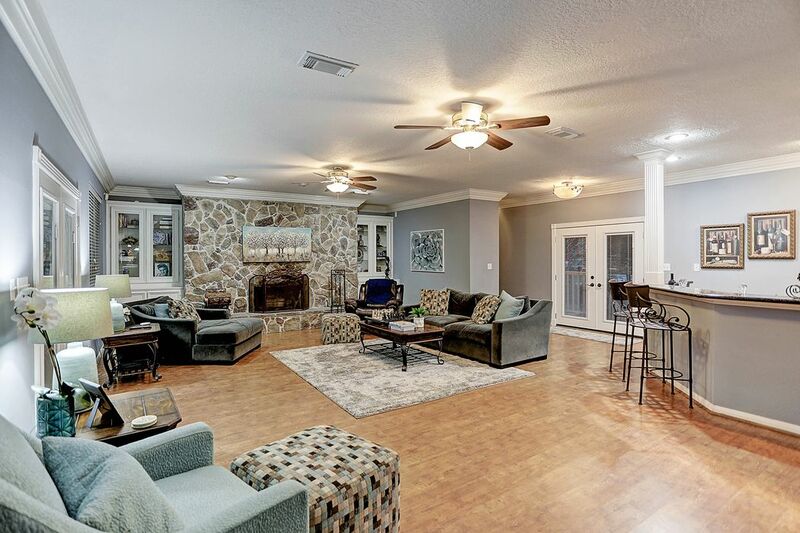 Inviting views of this warm family room, entertaining cocktail bar, and spacious kitchen. 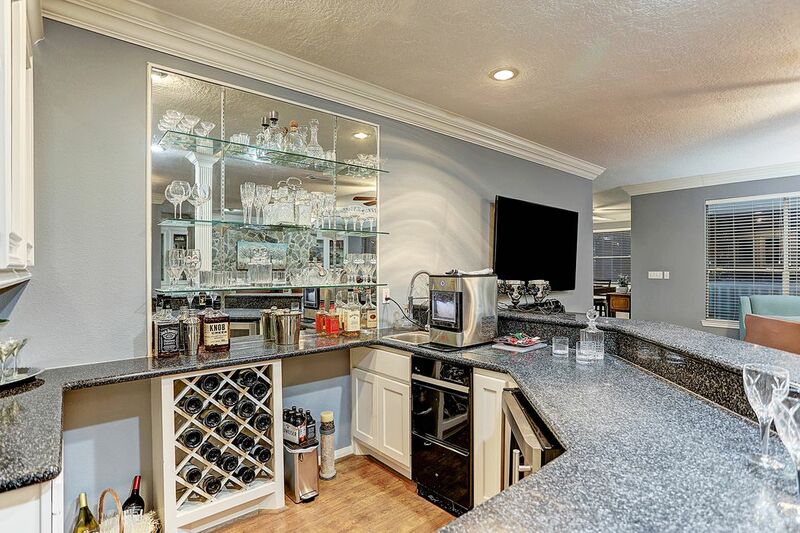 This fabulous Wet Bar is made for entertaining and hosting great company. 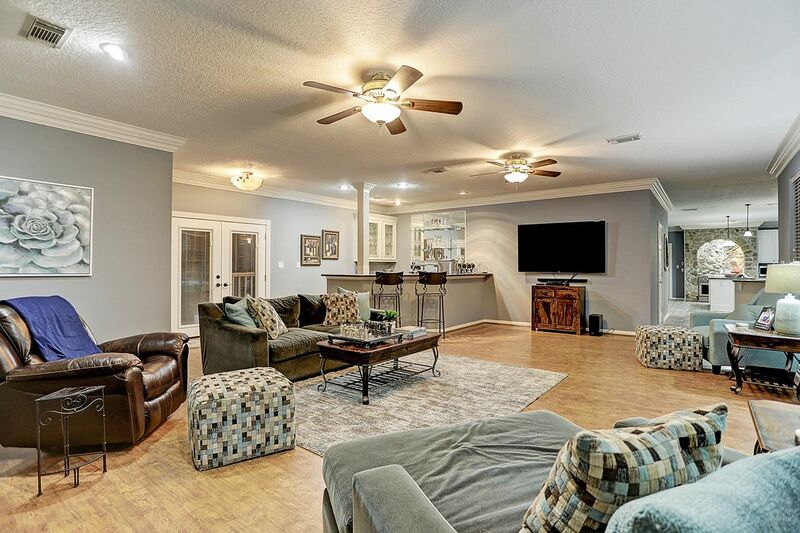 Make your preferable drink of choice and lounge in the Family Room or head out to the poolside. 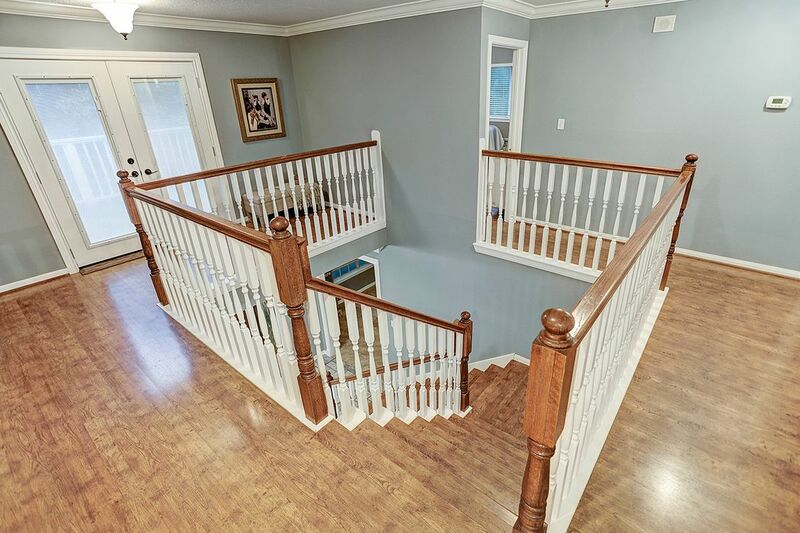 Spiral stairs leading you to the expansive lounge space upstairs. 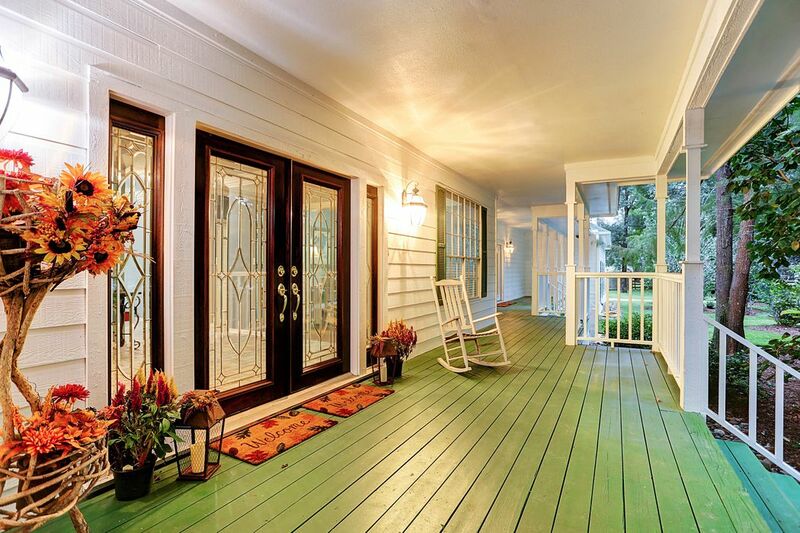 Double doors lead to a front balcony to watch kids play in the front property. 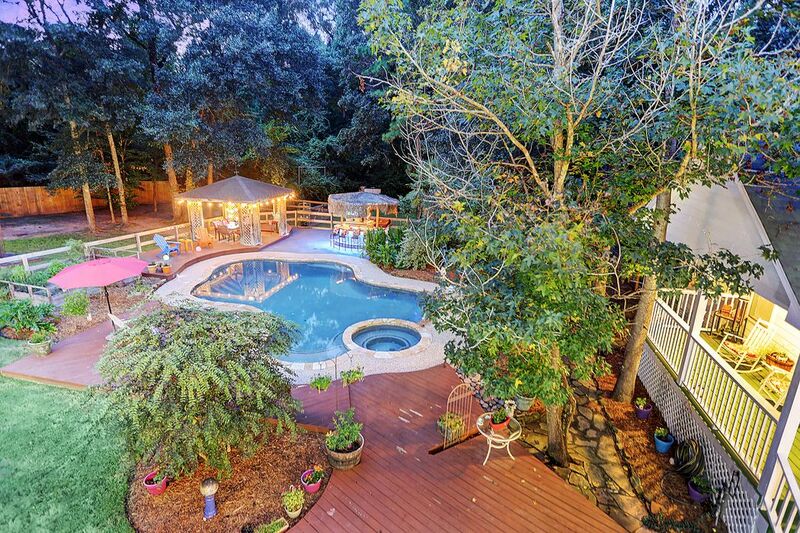 A great view into how secluded this Master is from the rest of the upstairs. Double doors leading to the upper private balcony for a great evening sunset. 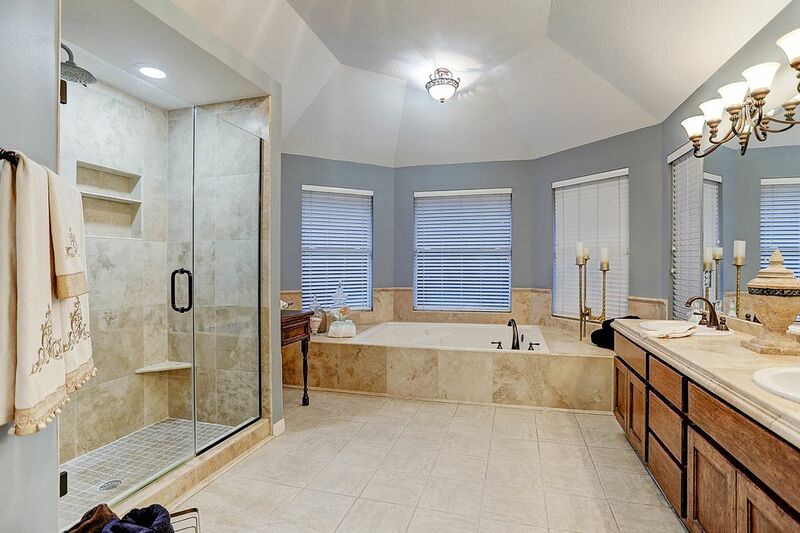 Travertine encompasses this Master Bathroom making luxurious spa get away. 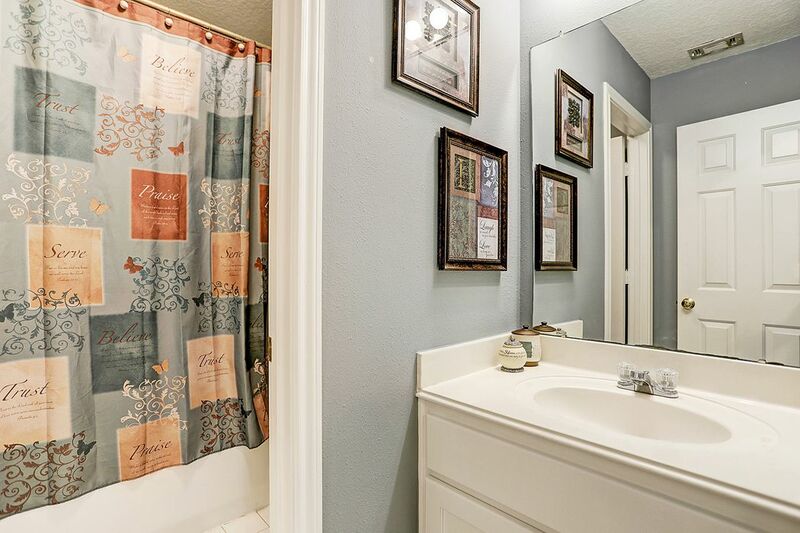 This recently updated Master Bathroom includes a wide frameless shower, jacuzzi, and double vanity space for you and your loved one. 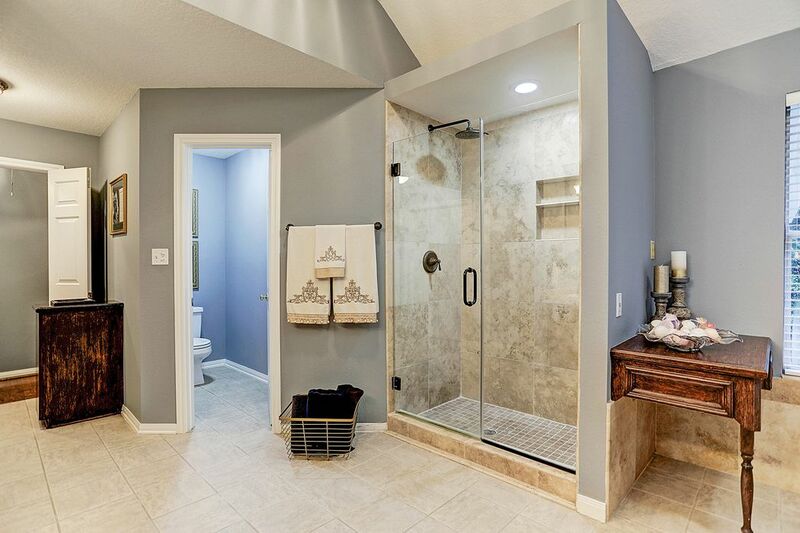 A look into the recently upgraded frameless shower with travertine back splash and paint job for polished look. 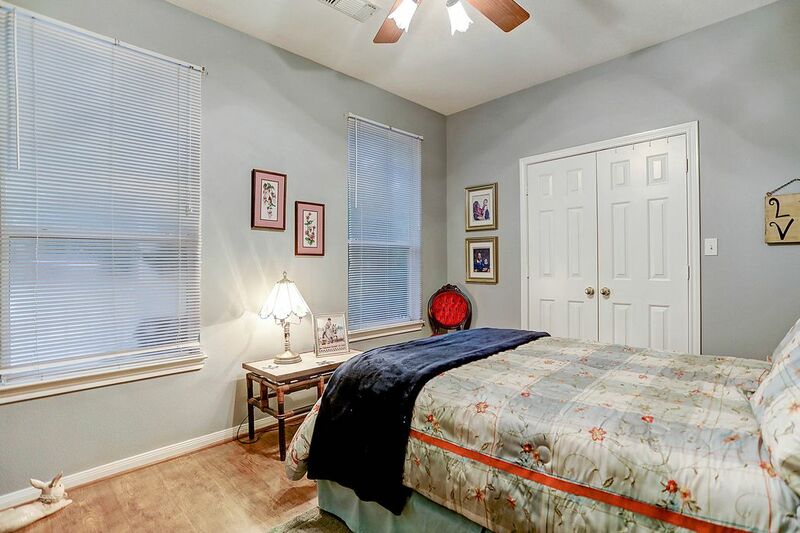 2nd Bedroom including large closet space and a great view of the back yard oasis. Bathtub/shower combo offered in this bathroom. 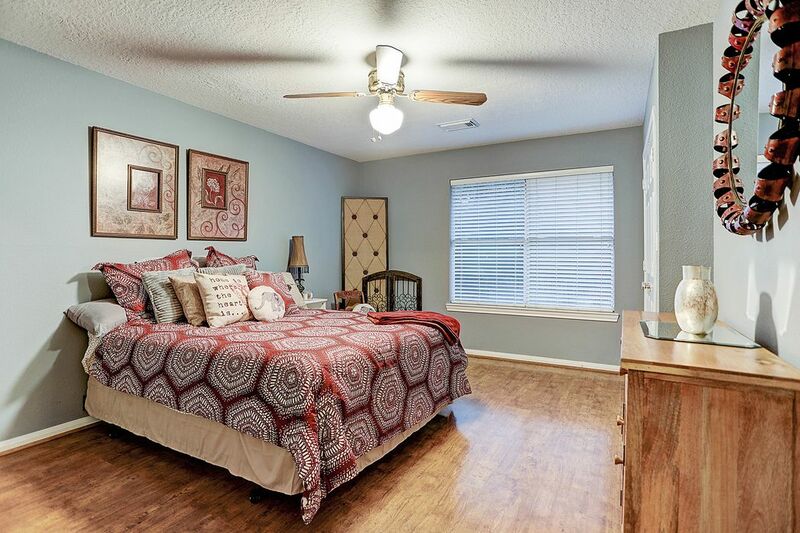 The first bedroom offered in the upstairs offers walk in closet, wood flooring, a view of the front property, and great space to make our own. 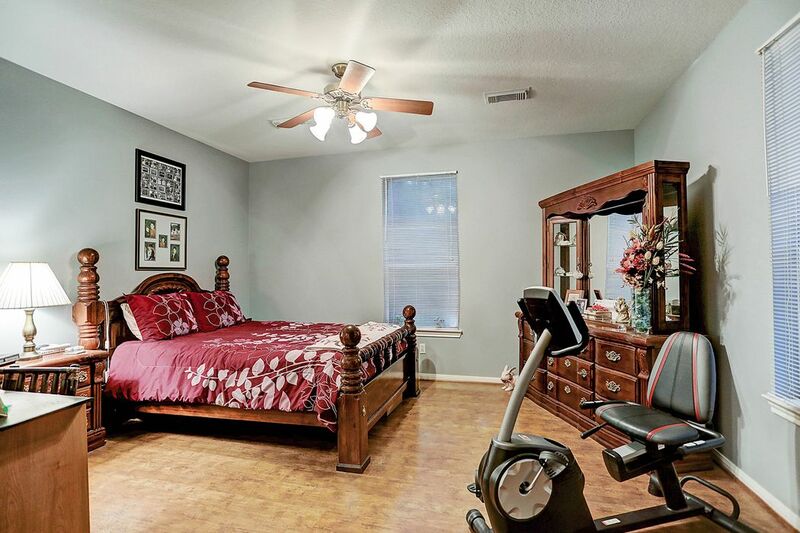 Spacious 3rd Bedroom sharing a Jack-in-Jill bathroom with 4th Bedroom. 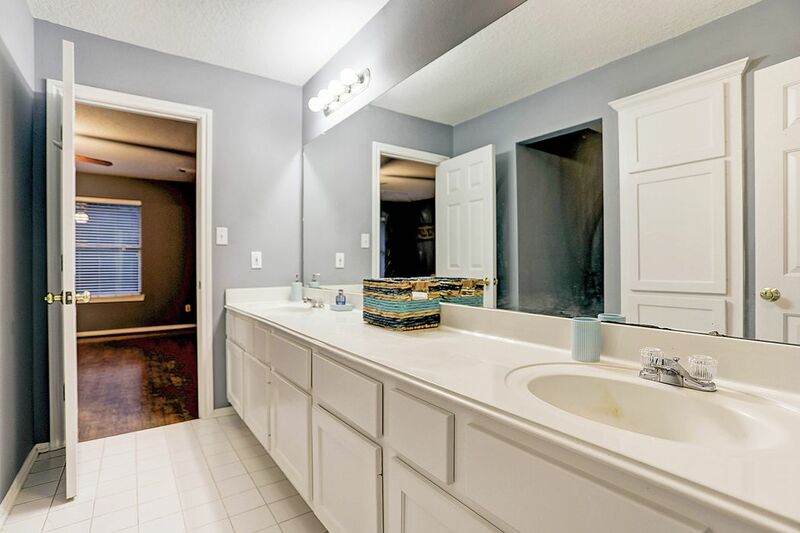 Large ensuite bathroom for 3rd and 4th bedroom including bathtub/shower combo and double vanity. 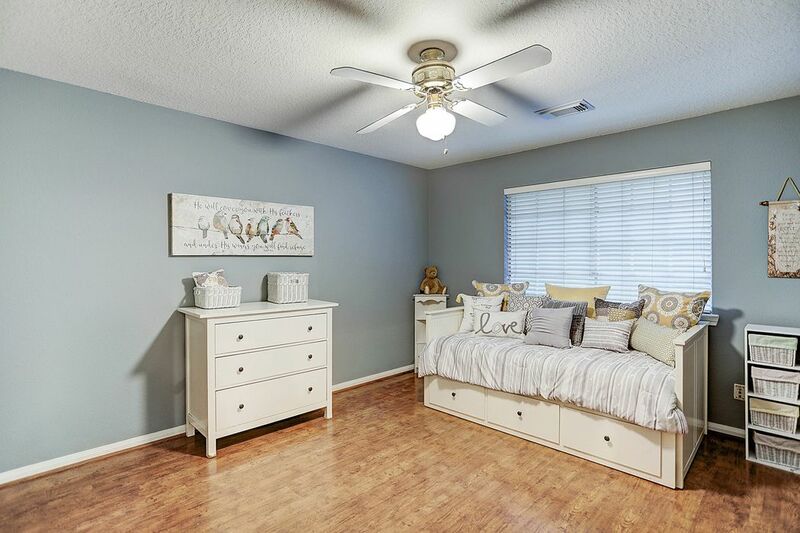 Cozy 4th bedroom filled with natural lighting! 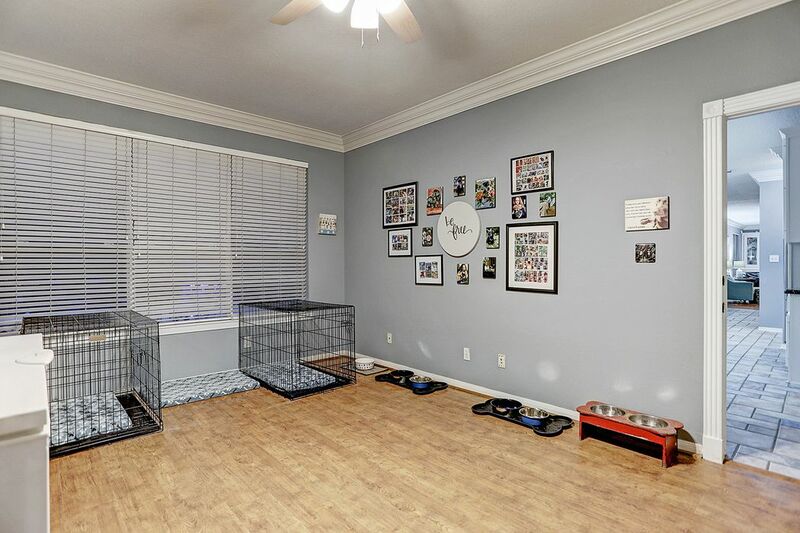 Just past the kitchen, this additional room is used as a Foster Room for puppies, however, it is great space to make an additional bedroom, craft room, or whatever your heart desires. 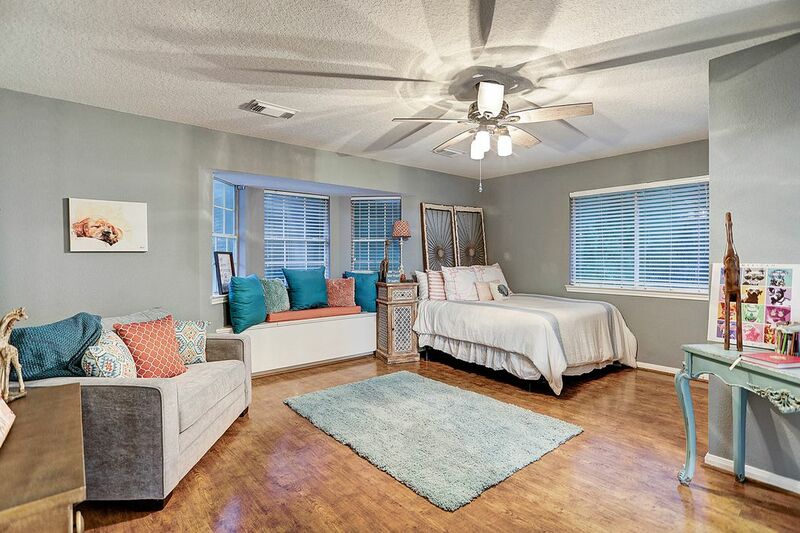 With immediate access to the back yard, this mud room is great for clean up after the kids play in the pool. 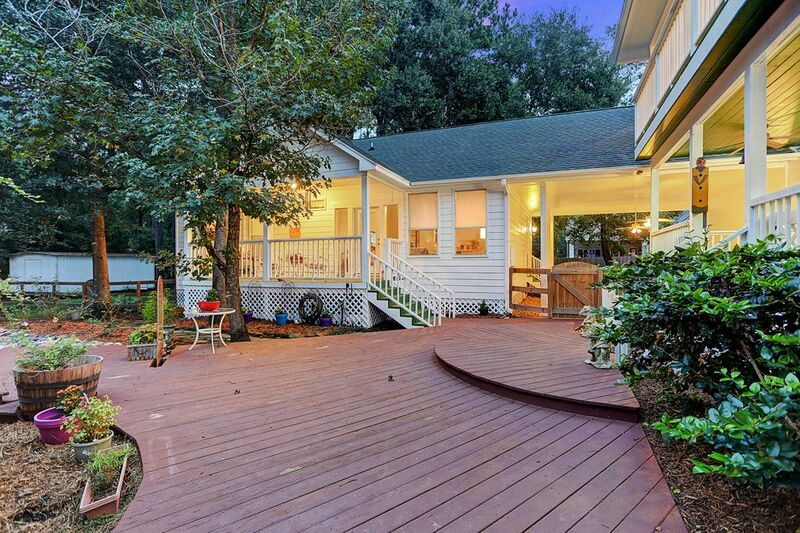 Opening to the spacious covered back porch, take in the awe-inspiring environment and amenities. 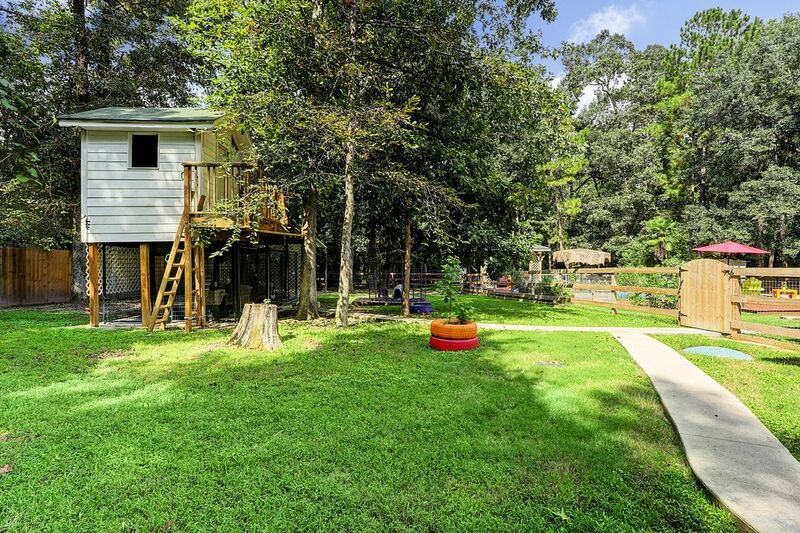 Located on the left side of the Main House, kids will enjoy venturing away to this jungle treehouse. Fully fenced in 2017 and pet-proof and pet-friendly, you can feel secure knowing your loved ones are near. 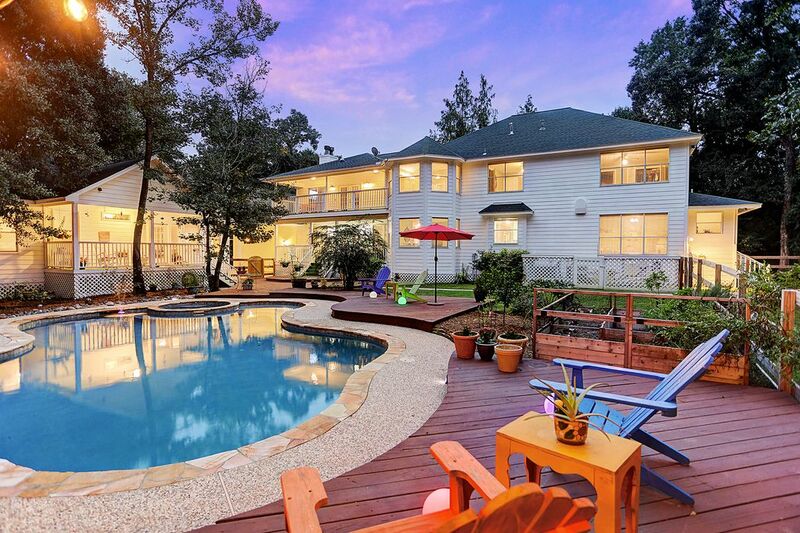 Escape to this magnificent estate- not one but two homes. The second home, a guest homes stands complimented with a wonderful floor plan including living room, kitchen, two bedrooms, and one bathroom. 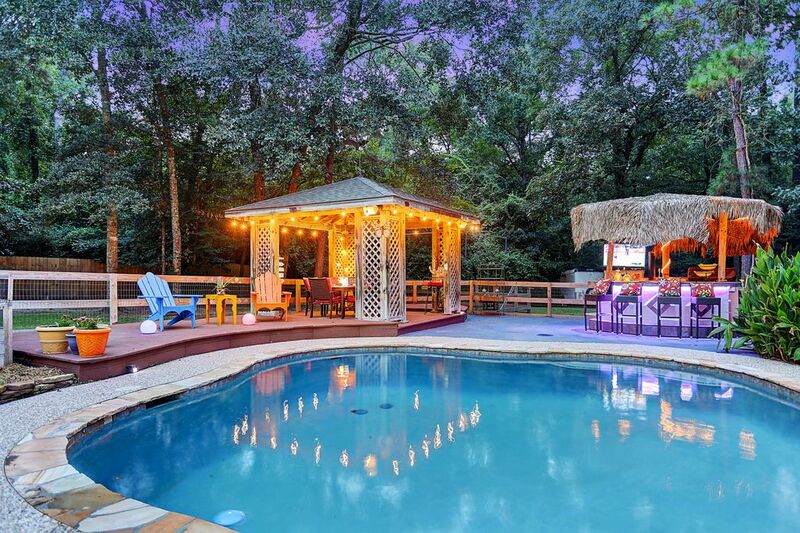 Made for effortless entertaining, enjoy this back yard pergola, sparkling pool, and outdoor kitchen/bar with family and friends. 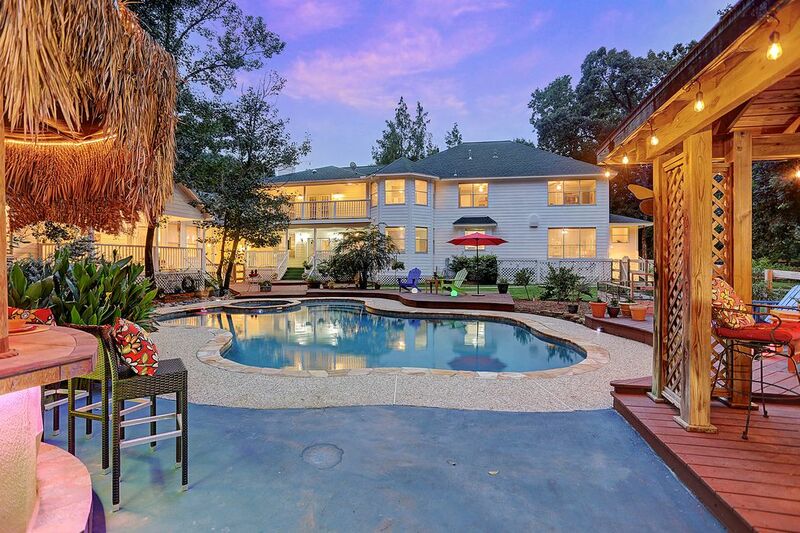 Beautiful lighting of this home at dusk gives warm ambiance for all who enter. Alongside the in-ground salt water pool, extensive decking can be found perfect for unwinding after a long days work. Welcome to the guest house at 11777 Creek View Lane! Just feet away from the main house, this guest house offers 2 bedrooms, a large bathroom, living space, and complete kitchen. A great view of the cozy living room available in the guest house. A complete Kitchen including all your essentials. 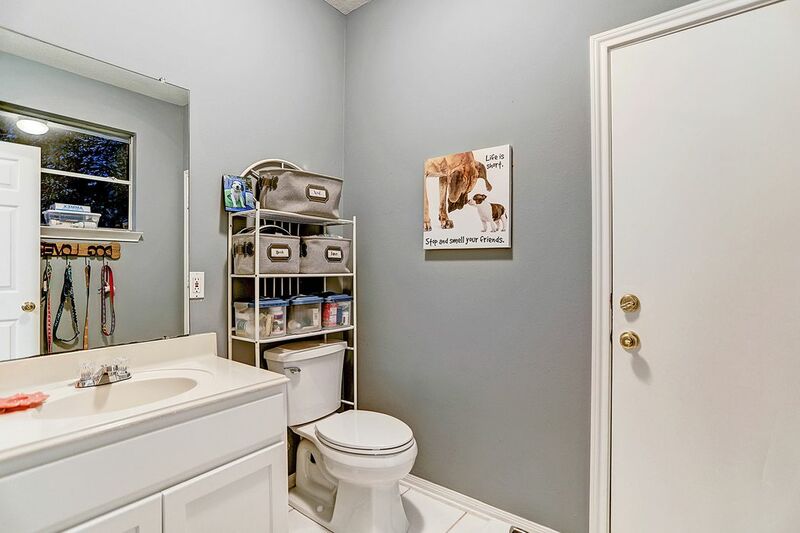 Utility Closet is connected with washer/dryer. 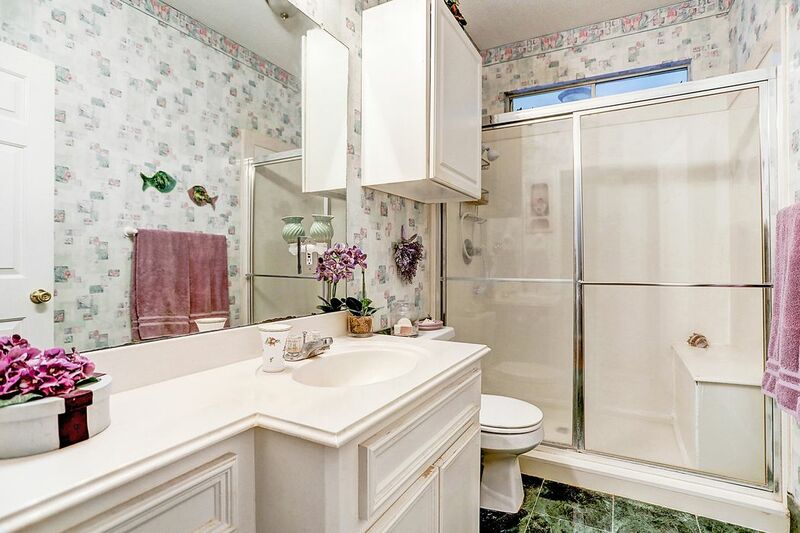 A Bathtub/Shower combo is offered in this guest house bathroom. 1st Bedroom located in the guest house with views to the poolside. 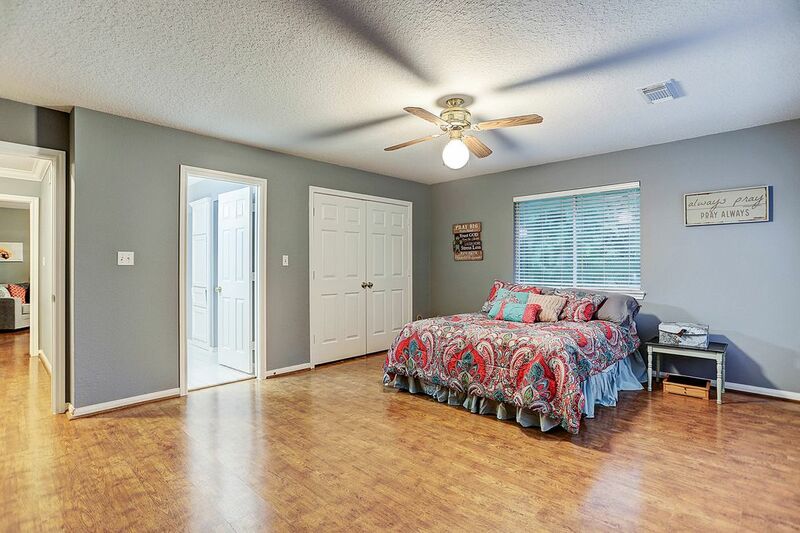 2nd bedroom offers a large space and views to the side of the property. 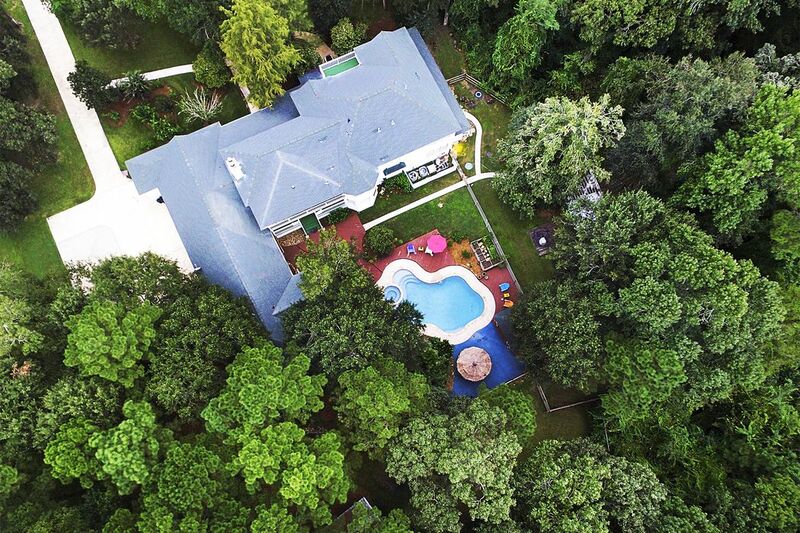 Spectacular ariel view of the main lot, 11777 Creek View Lane! Spectacular space to relax and entertain. 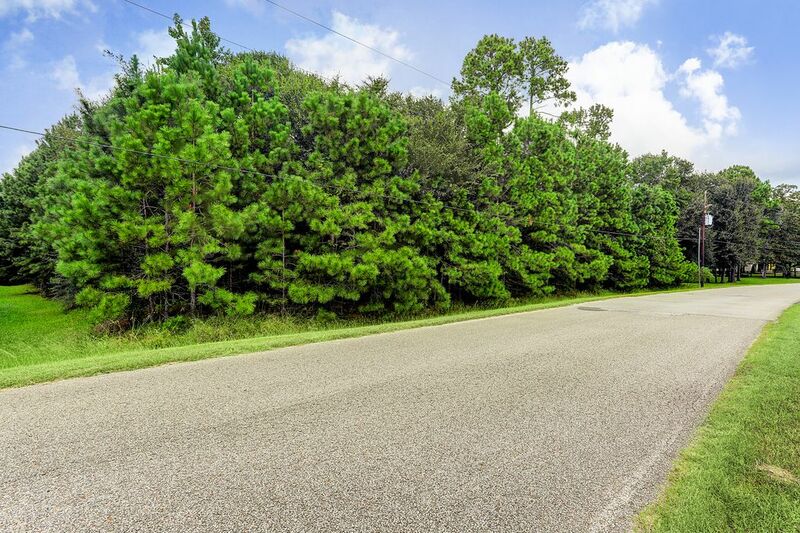 Right next door to 11777 Creek View, this 1.8 acres lot is INCLUDED with the purchase! 3.2 acres overall for you to make your own dream space! Can be sold separately. 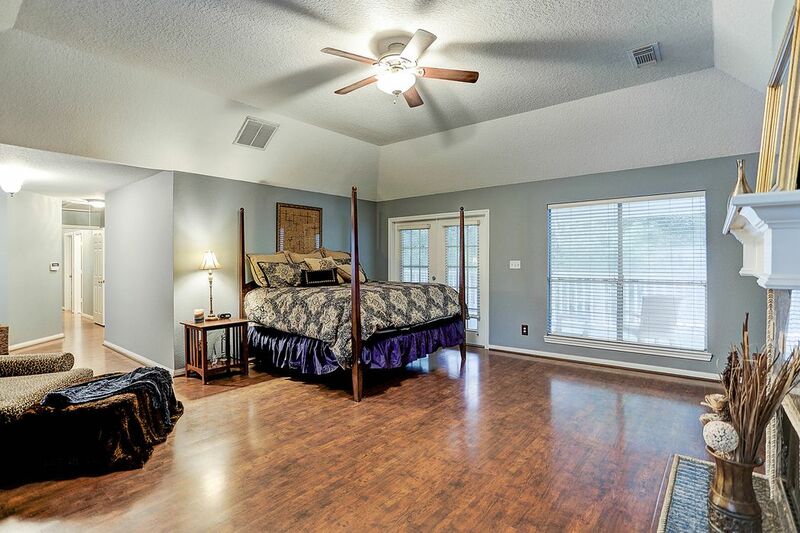 Step out onto the Master Bedroom private balcony and enjoy this fantastic view of the back yard property! 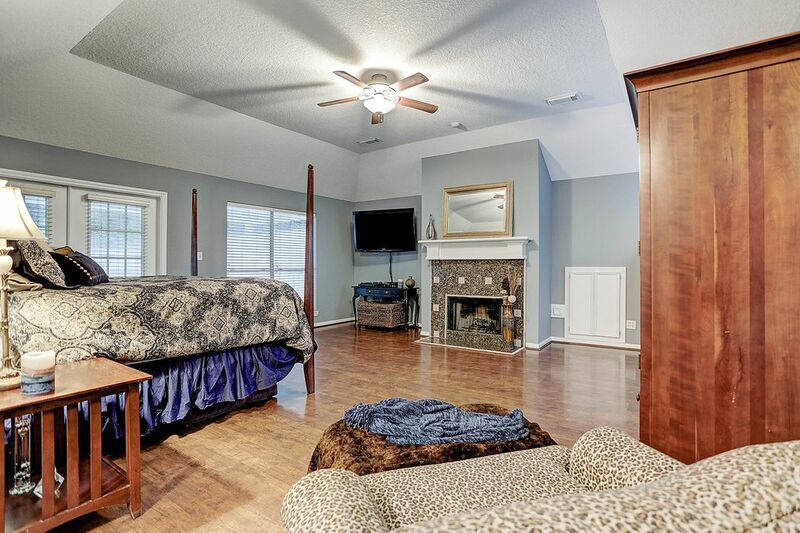 $850,000 5 Bedrooms3 Full / 2 Partial Baths5,375 sq. 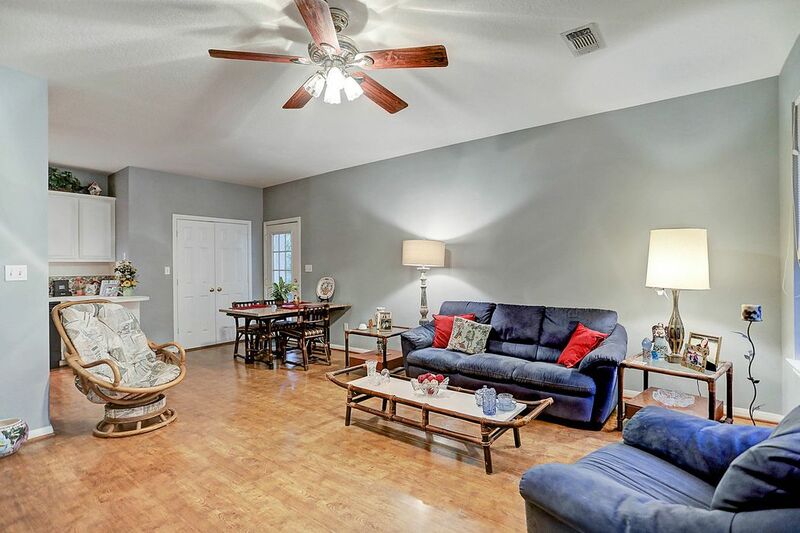 ft.
Country-style estate, nestled in Conroe with the bonus of a 2-bedroom, 1-bath guest house. 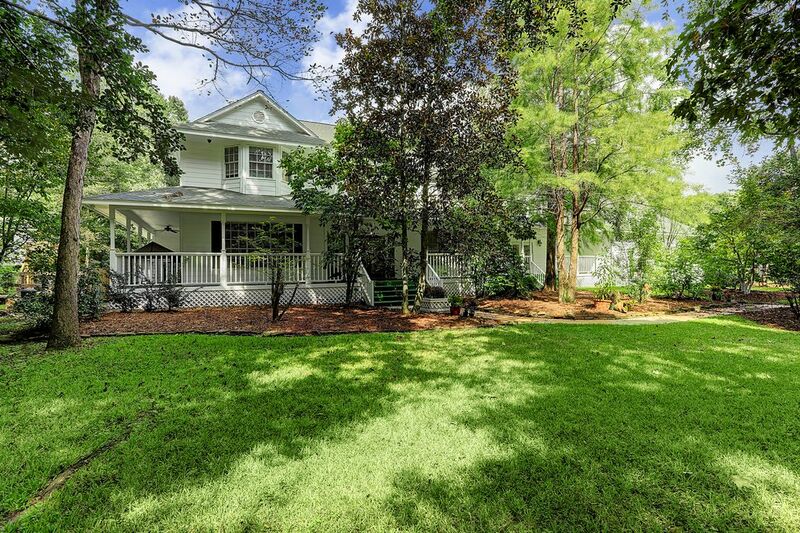 This lovely home is situated on 3+/- park-like acres (additional lot included in purchase). With a wrap-around porch, pool/spa, outdoor kitchen cabana and covered lounging, this estate is fit for both leisure and entertainment.